Heeft u een vraag voor SDT Home? Voor reizigers die komen voor de bezienswaardigheden van Chiang Mai, is SDT Home een perfecte keuze. Gelegen op 2.2 km van het hart van de stad, bevindt dit 2-sterren hotel zich op een excellente locatie met de grootste attracties binnen handbereik. Dankzij de praktische locatie liggen alle belangrijke trekpleisters in de buurt van het hotel. Het SDT Home biedt tevens vele faciliteiten om uw verblijf in Chiang Mai zo aangenaam mogelijk te maken. Gasten kunnen gebruikmaken van hotelfaciliteiten als wi-fi in openbare ruimtes, parkeerplaats, roomservice, tours, wasserij. Treed binnen in één van de 7 uitnodigende kamers en ontvlucht de dagelijkse stress met een breed scala aan voorzieningen, zoals internet (draadloos), draadloos internet (gratis), rookvrije kamers, ventilator, douche. Hotelfaciliteiten als tuin bieden alle gelegenheid om te ontspannen na een drukke dag. Ontdek een boeiende mix van professionele dienstverlening en een breed scala aan faciliteiten in het SDT Home. The hostel is outside the main square so it's very quiet which was ideal for us. It is close to the main tourist attractions and the night bazaar so you can walk pretty much anywhere you want to go. The staff are very laid back and friendly and they have some beautiful friendly dogs. The Wi-Fi is the best we've had in 4 months travelling around South East Asia. Also we were able to print our travel documents there for free. The laundry service is quick and a reasonable price but not completely thorough (some clothes came back still dirty). The room is small and basic but has everything you need. The shower is very small but has decent water pressure. For the price this place is such a bargain. We had a great stay. Room is nice and clean.Staff are kind.But there are very very many mosquitos in room and i could noy gall a sleep and i got mosquito net at front and killed about 20 mosquitos and after that i could fall a sleep,but there are still some.I beg to hotel that please think seriously about this problem.Other is perfect. The place is definitely not luxurious- very simple stay, but rooms are clean, staff is lovely. There is free coffee, tea and bananas (surprisingly lots of delicious choices). They even gave us masks because we were heading to Pai on our bike and there is a lot of dust due to construction. Great budget place. Amazing place! Short walking distance to all the main attractions/Old town. The owners are very friendly and helpful. They will make sure that your stay in Chiang Mai is comfortable and memorable. We initially booked for 3 nights and decided to extend for another 3 nights. The garden is so nice and peaceful as well as the awesome lounge area. I highly recommend this amazing place!! 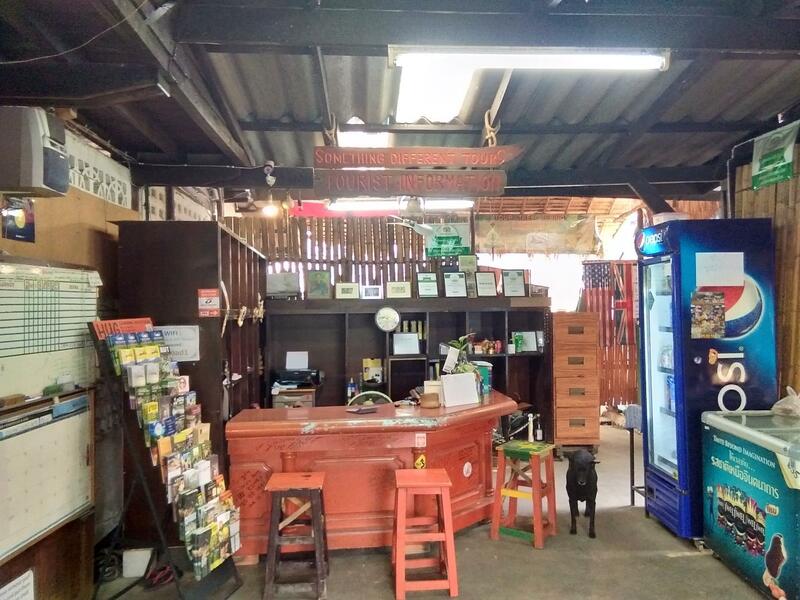 this hotel is good for backpachers or person who travels alone because staffs are all very kind and friendly and its eassy to join their drinking.location is very good.its lacated center of cchiang mai and you can walk to night bazar or famous temples.facilitie is clean and cokfortable for this price.i think you will love this hotel and staffs.nothing to complain but mosquitos(so many mosquitos at public space but almost no mosquitos in rhe rooms)i will come back at this hotel again. It was overall a pleasant stay. The only 2 negative things are the very hard beds (only 1 of the 5 beds in the dorm has a soft matress) and that I woke up at night, because near the dorm is some kind of pumping machine (I still don't know what it was) which made quite a lot of noise from 2-4am...so my night was not so good. But the guesthouse itself and the athmosphere is good. To preface, it's inexpensive, so I wasn't expecting the nicest place. The staff was the friendliest I've met in Thailand but other than that, my biggest issue was that it felt pretty unsafe. Anyone could just walk into your room off the street and the staff weren't always there. The first night I stayed, I was half expecting my stuff to not be there when I returned. I stayed 3 nights though and felt better about it after awhile. I would not recommend for a solo female traveler, especially for 50b more a night, you can find a secure hostel close by. I stayed one night at this place, it was okay for a short stay. I had a room with another person with ensuite bathroom. However, the toilet was out of order, so I had to use the outside toilet. It was good for the price, but a little more clean would be better. The staff was really nice though. They let me print my ticket, and do not leave the key deposit since I left early in the morning. Good for budget travelers! My room at SDT was very similar to my Thai house in the village so if you're looking for an authentic old school experience you might appreciate it more than I did. it was too stuffy and hot to retreat to during the day and each outlet had a faulty socket. We are three people travelling together. This guest house appeared on Agoda with shocking price, while having good reviews. I am a bit suspicious, but I saw no extremely bad reviews, so I decided to book four nights with SDT home. The owner kindly emailed me to offer 150THB drive to and from the airport, which is cheaper than normal taxi (200THB). When I first arrived, there were two dogs coming out. I am not very good at dealing with dogs, and I discovered that they have four!! The staff were mostly male, friendly and make jokes with you quite comfortably. They gave me the senses of the local people just in my hometown Vietnam. The room, toilet and bathroom are clean. They provide one towel, 1 soap and 1 shampoo, pillow and blanket and free drinking water. When it got cold at night, you can ask for extra blanket. There are 5 beds in my room. It is a little bit dark, there was 2 doors without windows. Each bed has one small lamp. Also ,there were lots of mosquitoes around in the bathroom and a few in my room, although they had net doors. You might need to buy mosquitoes spray or lotion in the pharmacies to somehow avoid mosquitoes attack. There were always several staff siting around the reception at anytime, so you can ask for directions, maps and recommendations for travelling. At night, they play guitar and sing or turn on some relaxing music. This made us feel that we were part of the local people here rather than tourists. 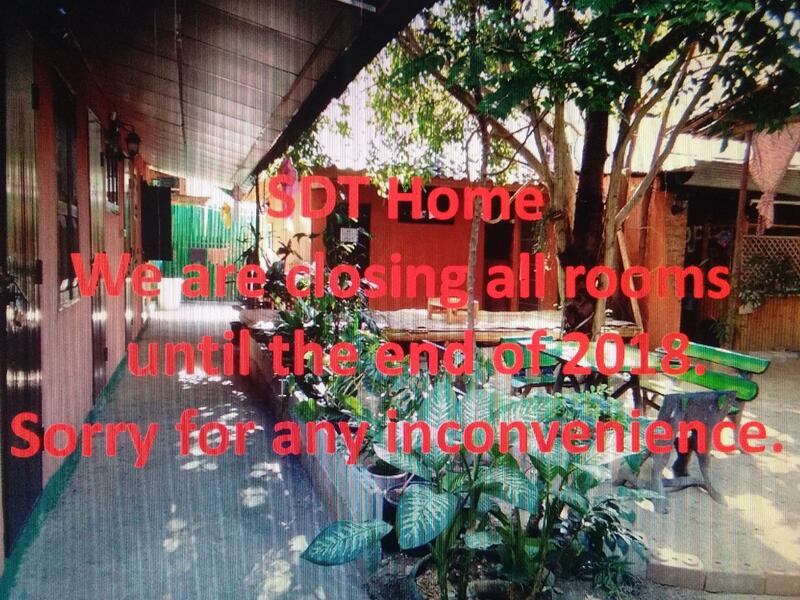 SDT home is certainly part of our memories travelling to Chiangmai. After getting familiar to this place, I somehow developed my love with those four dogs, especially when I watched them sleeping, they looked nice and lovely. I gave SDT Home 10 points, and I think they deserved that. Thank you, SDT Home! Everything about this place is great! The location is perfect (though it is a little hard to find, especially at night.) The ambiance is fantastic. It is very mellow unlike your typical busy hostel and sometimes you forget you're in the middle of a city. I think the best part of it all was the staff. They are wonderful and they really know how to make you feel like family. Definitely worth the money. I will be back! I had a fantastic stay at the SDT home. Everyone was extremely friendly, and I met some awesome people. One of whom I'm currently traveling with! Very family like environment with a bohemian vibe that made for a really relaxing stay. This place is miles away from ordinary, in a good way. Awesome little place! Nice garden setting. Very helpful and friendly staff. Basic clean cheap accommodation. No AC here but unless you plan on staying in the room all day, it's no problem. The fans are sufficient enough. Great backpacker spot! Everyone was so welcoming! As soon as I arrived a whiskey and soda was pushed into my hand and I was being fed BBQ food :') 'you're staying in our home, which makes you part of our family!' What lovely people :) it was one of the staff members' birthday that evening so we had a huge party and everyone had so much fun. The atmosphere was excellent, room was very clean and incredible value for money! I would recommend this place to any solo traveler, absolutely fantastic! The staff there are really helpful and friendly, sometimes they will play some music in the lobby and we could join. The room is tidy and surprisingly there were no mosquito during night. This is much more better than what I thought before and it worths its price! I also knew some new friends there, some from the Europe and some from the Asia. Will surely come here again next time. The hotel staff are super friendly, the location is perfect, quiet but close to everything at the same time and great atmosphere! This was the best place we've stayed at in Thailand. It feels like you're part of a family and we felt very welcomed and at home. The rooms are great for the price (300 Baht for a double room), they are super clean and there is a nice bathroom with it with a shower. You can get free water, tea and coffee all day. 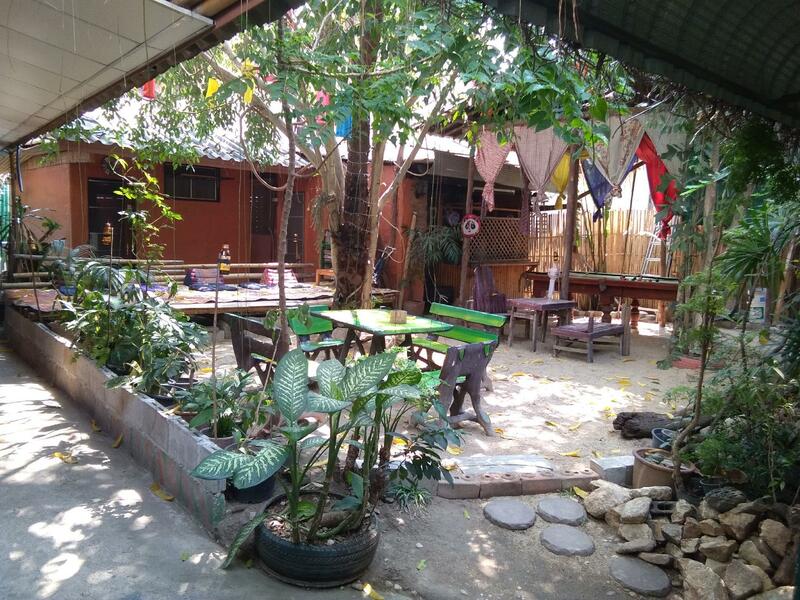 There is a chilling area in the middle of a small garden which looks like paradise and is great to meet other backpackers. Would higly recommend this place and will definitely come back for our next stay in Thailand! My stay was okay - the staff were friendly and helpful, which was nice. The room was very small and the beds were rock solid (I'm pretty sure the mattress was only 5cm thick). I had an absolutely horrible sleep every night we stayed there. The washroom was quite unique, but also a bit awkward as there are stones all over the floor with only stepping stones to walk on. As well, when you took a shower the drain seemed to be clogged a bit which caused the water to rise. The location also was not very good. It's on the outskirts of the Old City down an alleyway and is quite a walk away from anything. There are much better options in Chiang Mai within the same price range. We stayed in two guest houses in Chiang Mai before we got here and we wanted to stay in the city 3 more days just to stay here. The place is extremely well equipped and besides all the basics you get mosquito nets in each bed, free coffee, tea or water, you can rent scooters and tours, in fact people that don't stay there come to get the tours because they are so well planned. Pet that runs the place solves any problem that you may encounter, to the point that he got the guest house in Chiang Rai (our next stop) to make valid our payed reservation for one day later since we couldn't get a bus because they were all full. Best guest house so far in my trip, thanks for everything!